Successfully Added Happy Buddha Tourbillon Swiss Watch (Midnight Blue) to your Shopping Cart. Happy Buddha Tourbillon Swiss watch in a midnight Blue color, showcasing the precise flying Tourbillon that features subsidiary seconds on the Tourbillon, Côtes de Genève. Framed within a brushed stainless steel case with double curved Sapphire Crystal Cabochons and polished bezel, and secured using a premium quality crocodile style leather strap. The Happy Buddha Tourbillon combines the artistic style from the orient's masterful craftsmanship and the intricate design of the mechanical Swiss Tourbillon. The Happy Buddha Tourbillon Watches comes in a unique never before seen dial characters that represent each of the Chinese year's astrological zodiac symbols. The CVS-KULTUHR is designed with superior materials offering exceptional quality and accuracy. 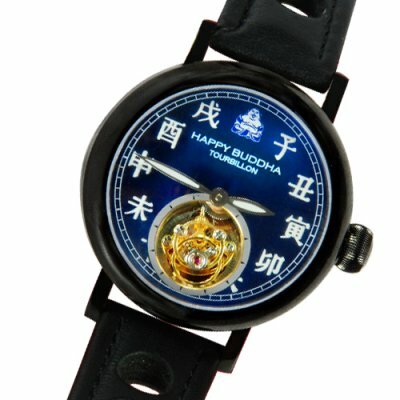 The limited edition Happy Buddha Tourbillon Swiss watch comes in a stylish leather strap with folding butterfly clasp design, mechanical hand-winding Flying Tourbillon seconds indicator, stainless steel brushed case, luminous dial hands, Chinese zodiac characters in white color which sits nicely on a midnight blue background, sapphire crystals, top grade 361L stainless steel, screwed on back case and 5 ATM water resistance. Flawlessly applied elegance and luxurious lines form the core of this intricately crafted Swiss watch. Perfect for any occasion and moves effortlessly from the office to the Golf course and on to the evening party. This exuberant Swiss time piece is presented in a beautifully hand-crafted Chinese luxury gift box in black piano-polished wood. This Swiss Tourbillon design is presented by Kultuhr as the special limited edition Happy Buddha Tourbillon Swiss watches of which only 99 of this model have been produced worldwide. We reserved the last 8 of this limited edition series (the number 8 being the luckiest number according to Chinese legend). The midnight blue happy Buddha Toubillon wrist watch makes a brilliant present for fathers, grandfathers, graduations, anniversaries, favorite uncle, Son’s and pretty much any special occasion you can think of. This astonishing hot new Happy Buddha limited edition Swiss wrist watch is in stock now, and available to you from the king of factory direct wholesale electronics, Chinavasion. What is a Tourbillon? Invented by Abraham Louis Breguet in 1795, the Tourbillon places the balance wheel, escape lever, and escape wheel into a pivoting cage oscillating and rotating itself around the axis of the frame every 60 seconds, acting also as a second hand. With this rotation of the escapement, the effects of friction and earth's gravity are suppressed as all parts of the escapement are equally exposed to its influence. Few master watchmakers are able to execute such an ingenious mechanism requiring complex engineering skills and thus the Tourbillon remains one of the most valued complications. Between 1795 and 1945, less than 800 Tourbillion’s were made worldwide.